THERMO LABEL ® SUPER MINI 3R is single-use indicators irreversibly change its color from white to black by reaching or exceeding color changing temperature. Best suited for temperature control of electronic and electric parts like transistor, IC, capacitor and small motor. 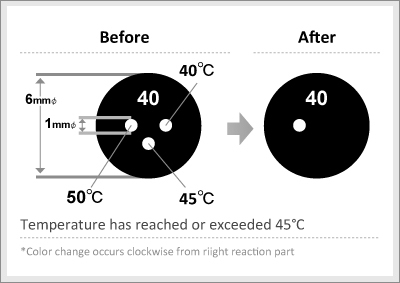 3 steps temperature indication with 5°C increments. Apply on flat surface. THERMO LABEL® SUPER MINI 3R might drop from uneven applying surface. Do not cut THERMO LABEL®SUPER MINI 3R. This may reduce the durability of product and cause abnormal color change. Outdoor use:THERMO LABEL SUPERMINI 3R is not designed for outdoor use. Do not use in outdoor. THERMO LABEL SUPERMINI 3R is not designed for outdoor use. Do not use THERMO LABEL SUPERMINI 3R under liquid (such as water, oil, grease, plasticizer* or solvent) affected condition. When THERMO LABEL SUPERMINI 3R absorbs the liquid, indicator may change color and/or may impact adhesion of THERMO LABEL SUPERMINI 3R. 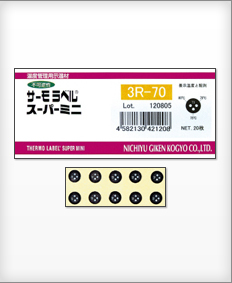 THERMO LABEL®SUPER MINI 3R contains no toxic substance according GHS classification except from 3R-110. Please refer to MSDS of appropriate products for detail. THERMO LABEL®SUPERMINI 3R doesn’t contain chemical substance prohibited in the RoHS directive.